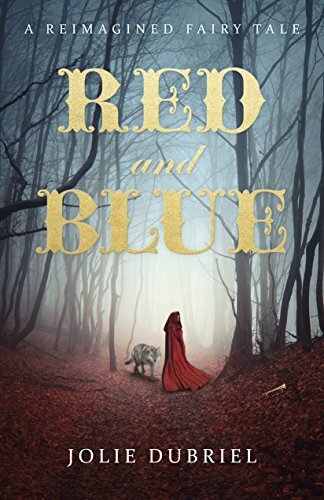 Red and Blue is a fascinating story that combines classic fairy tales and nursery rhymes and adds many new twists. What was the inspiration that made you want to write this story? I’m a huge Broadway play so the big inspiration was Into the Woods. I watch the original Broadway play and the Disney movie. In college in my theater class, we had to do a project on a play. I chose Into the Woods by doing an original monologue. “Red & Blue” was born from that monologue of what happened after the total disaster of the story. There were so many interesting characters, some pulled straight from fairy tales. What was your favorite character to write for? Humpty Dumpty was one of my favorite characters to write. He’s such a nervous character. I pictured him full of cracks and could completely fix him from being pushed off that wall. While I was writing him, I was laughing cause it was so much fun. I tried to have him as the comic relief in some ways until you meet Mother Goose. She’s a character herself in the story. Red and Blue have an intriguing relationship. What were the driving ideals behind the characters development throughout the story? 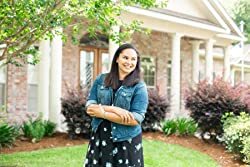 The character development kind of just flowed from the little girl we all know from the storying Little Red Riding Hood to the character that is in the story. I wanted her to be different from the character that has been written for the character. She is either changing into a werewolf or an assassin with everything in between, I didn’t want to go in that direction. I wanted to keep the spirit of the original story intact but she still has to work through her childhood mistakes. Boy Blue, on the other hand, is completely different from Red Riding Hood. I was inspired by boy bands for his character. The total “freedom” of being a guy without any strings attached to no one until this girl with a story catches his eye without even seeing her face. His own character development goes from being a boy to man within a matter of days with choices that help him along the way. I’m working on a sequel to Red and Blue. I want to explore the next stage of their relationship which is marriage. It’s not going to be easy but I’m willing to try. I hope and pray that it’ll complete by next year or at least 2020. Once upon a time, there was a young woman who wore a red cape. She kept her face hidden from the world around her. Her was Rosaline, but the villagers have forgotten her name. She is Little Red Riding Hood. Thirteen years have years have passed since Red Riding Hood was cut from the Big Bad Wolf’s belly. She is quiet and distant. The villagers believe that Red Riding Hood is marked by the wolf who swallowed her. Until a strange young man with a golden horn tied to his back finds her intriguing. The young man set off on a personal mission to see if the rumors are true. 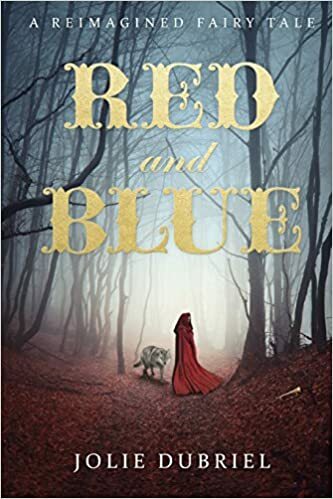 Jolie Dubriel’s Red and Blue is a fascinating, re-imagined tale that combines both classic fairy tales and nursery rhymes with many twists and turns. Dubriel takes old favorite characters and story lines you knew, loved, and memorized during your childhood story times and weaves them together as one beautiful story of secrecy, heartbreak, and the power of love. Obstacles and setbacks are sprinkled in along the way on the journey from once upon a time to happily ever after. Nostalgic characters Little Red Riding Hood and Little Boy Blue are now grown-up characters who play the lead parts. Humpty Dumpty, Old King Cole, and other classic figures also pepper this amazingly creative compilation. Like any classic fairy tale, this book is not without tragedy. As is par for the course, there are separations of young children from parents and premature deaths of parental figures. There are hearts broken and healed. Red and Blue are coming of age characters who are growing up, discovering who they are, who they want to be, and who they begin to have feelings for. Stories from the past surface that throw wrenches in plans and change life trajectories. The story is full of conflicts and characters trying to solve them. The dynamic as old as time, good vs. evil, is also prevalent in parts of the story. I love a good anthropomorphic animal or inanimate object, and those characters seen in the Kingdom of Rhyme do not disappoint in this area. Animals and objects are personified throughout the story. Fish, salamanders, cats, and dogs walk around in suits as servants and guards in King Cole’s castle. A dish runs and talks with a spoon through the forest. A cow jumps over the moon. These are the kinds of things that a nostalgic childhood reader will love. The half human/half animal or object cast of characters are reminiscent of those kinds of splits found in The Wizard of Oz, Beauty and the Beast, The Sword in the Stone, and Bedknobs and Broomsticks. I like the twist that Red’s story takes regarding her relationship with wolves. Red and her grandmother have their classic encounter with the Big Bad Wolf, and miraculously survive. Later, her loving stepfather gifts her with a little wolf pup that grows to be her best friend and companion. It’s refreshing to see the girl have the upper hand over a wolf in one of these tales. What classic tale would be complete without magic? The ultimate symbol of magic in this story is Little Boy Blue’s golden horn. He is unaware of its power, but has been cautioned to keep it with him always. Blue has grown up with the horn strapped to his back while working on a farm. It is only later that Blue will discover his true identity and the power that the horn truly holds. I really enjoyed how Dubriel took so many classic and loved stories and characters and wove them together into one cohesive story. It is truly a feel-good kind of read. It is a love story that keeps its innocence. There is some tragedy and conflict, but I think it’s appropriate for pretty much anyone. Middle schoolers through adults will enjoy this book. Jolie Dubriel may have written a “new classic” with this book.